Our fascination with fairy stories seems to be forever rooted in our bones. Whether it’s because they come from a dark place and, like truly immortal stories, have evolved over time to suit the tastes of generation after generation, who knows. From terrifying and disturbing cautionary tales to saccharine Disney creations, to dark TV shows, twisted fiction, and more, fairy tales have shadowed us, worming into our consciousness at every turn to embed themselves in our culture. They are iconic. Changeable. We twisted them to make them palatable, then, later, we tapped the sugar off and twisted them all back again – returning to the darkness. 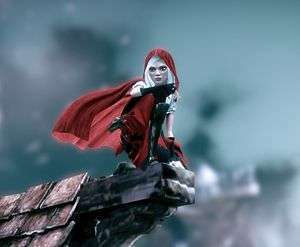 But our fascination is as strong as ever – they are simple but striking stories and characters, which can easily be manipulated and reinterpreted, and that’s what GRIN Gamestudio has done with Woolfe: The Red Hood Diaries. This gorgeous 2.5D action platformer started life as a Kickstarter campaign, which ended in September last year after achieving more than its modest (by game standards) goal, and is now sidling up to an impending release with an axe in hand. 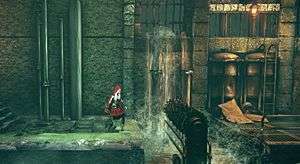 The game focuses on young Red, heading from the forest where she has lived a sheltered life, and into the big city of Ulrica, determined to find out the truth behind her father’s death four years earlier. Working as a Lead Engineer for Woolfe industries, Red’s father died in what was declared an accident. The subsequent investigation was prematurely closed, leaving Red and her Grandmother alone and with no answers. Bucking the trend of the cap-wearing, bed-ridden biddy, Granny apparently kicks arse, and has spent the last four years training Red to run and fight before packing her a basket of food and bidding her adieu as she sets off on her quest for blood and justice. What Red finds, however, surprises even her. The owner of Woolfe industries is one B. B. Woolfe, megalomaniac and tyrant, who is surrounded by an army of tin-men, which he use to maintain order. As his grip on the city of Ulrica and its people tightens, poverty and death are the grim reality into which Red sneaks, looking for answers. The game is billed as an action-platformer and throws at you the sort of gameplay you’d expect. You traverse the environments, such as ledges, pipes, crates, and grates, moving from from A to B, solving basic problems along the way, although nothing more taxing than levers, gates, and the occasional timed sections. When you get to where you’re going, there is often some casual exploring to be done, but not too much, in order to unravel more of the story. As much as I enjoyed the gameplay, there’s just something about it that bothers me and I can’t quite put my finger on it. I suppose part of it is that it feels a little too… I don’t know… easy and almost fragmented? That’s not to say that I want hair-tearing, endless sections of platforming insanity with obtuse puzzles, backtracking, and near-unbreakable death cycles, but the whole thing felt quite light, in a way. It was like the action was something to do in between the story, rather than being as truly absorbing as I wanted it to be. Being as it is still in beta, however, and the first boss battle I reached was still (amusingly and literally) under construction, I imagine this will change a somewhat and become more fleshy (no pun intended). Truth be told, I didn’t actually mind that much, as the story and its branches were more than absorbing enough to pull me along. While it’s true that the platforming is pretty standard, the game does mix things up a little, with an interesting chase sequence that sees you running from a squad of tin men, traversing the environment as you go. It was a nice change to ledges and pipes and again, while not punishing, was nevertheless enjoyable. Straight platformer, this ain’t, however, and there is combat to get used to – your opinion of which will likely be skewed by what type of gamer you are. While there are several moves types (fast/heavy/aerial, etc.) and it is possible to combo them, I simply pressed whatever to get the job done, not really sure if I was pulling anything off (that’s what she said). It’ll be a while into the game before you get a weapon, so your best option early on is to outrun your mechanical foes if you can (and even later on, if you can’t be bothered with a scrap [me]). Even though this is her show, the developers have focussed on more than just Red, and (although he was still under construction) have written in other fairy tale characters, such as the Pied Piper. Later, according to GRIN, we can expect to see Creeping Beauty, and a sinister mechanical Pinocchio, given their own unique twist. The absence of the first boss battle in the build I played meant that I never got a resolution to the Pied Piper branch of the story, which was a shame, but I’m looking forward to it being properly resolved and to see whether or not it ties into the main plot. Along with the story, the environments are the star; they are beautiful – layered and detailed, with heavy inspiration taken from Dutch artist Anton Pieck. To be honest, the city also put me in mind of Fable 2’s Albion, possessed of an old-world charm, and dripping in character from every snow-dusted slate, gable, and leaded window. The game, aided by the whimsical and almost melancholic music-box-style score, is beautifully atmospheric, with the visuals and sound marrying perfectly with the subject matter to create a spellbinding and immersive experience. Being 2.5D, the scope for exploration is more limited and the levels are pretty linear, which was a great shame given how rich and enticing the environments are. There is usually only one way (that I found) to get from A to B, which again, was a real shame. This is such a lovely world, that the urge to explore and dawdle around is a great one, if only it could be indulged. Still, I was relatively happy with what I got, and there are collectables to be winkled out, which adds flesh to the bones and delivers some truly lovely bonus content in the form of diaries, models, concept art, and chunks of backstory, giving extra incentive to replay. 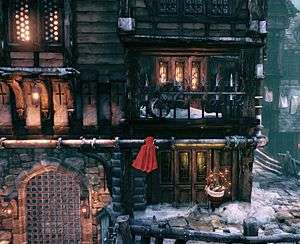 From what I have played thus far, even in its unfinished state, GRIN are on the right track with Woolfe: The Red Hood Diaries, and I’m hoping they have more tricks up their sleeves than Granny has goodie baskets. They’ve succeeded in taking these wonderful staples and weaving them into a dark, beautiful looking game. While the gameplay was less engaging than I would have liked, the environments, music, and story were more than enough to sustain interest and absorption in this world and its intriguing, unfolding story. 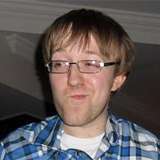 As a lover of fairy tales, platformers, and damn good stories, I’m looking forward to the game’s proposed March release. Looks like a visually pleasing game and hopefully the combat is a bit of a challenge. If so, this could be one for me.